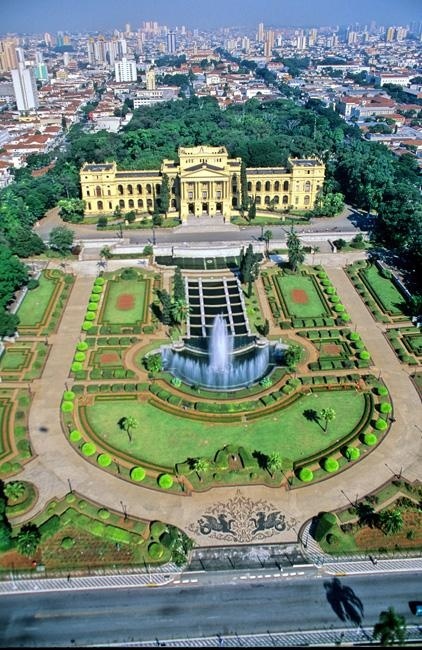 The Museu Paulista of the University of São Paulo (commonly known in São Paulo and all Brazil as Museu do Ipiranga) is a Brazilian history museum located near where Emperor D. Pedro I proclaimed the Brazilian independence on the banks of Ipiranga brook in the Southeast region of the city of São Paulo, then the "Caminho do Mar," or road to the seashore. It contains a huge collection of furniture, documents and historically relevant artwork, especially relating to the Brazilian Empire era. The most famous work of art in the collection is the 1888 painting Independência ou Morte (Independence or Death) by Pedro Américo. A few months after the Brazilian Declaration of Independence, people started to suggest a monument on the site where the declaration took place, although they were not sure about what sort of memorial construction to build. In 1884, Italian architect Tommaso Gaudenzio Bezzi, who was hired to develop the project, chose to build an eclectic-styled construction similar to the French Palace of Versailles with impressive and perfectly manicured gardens and fountain.